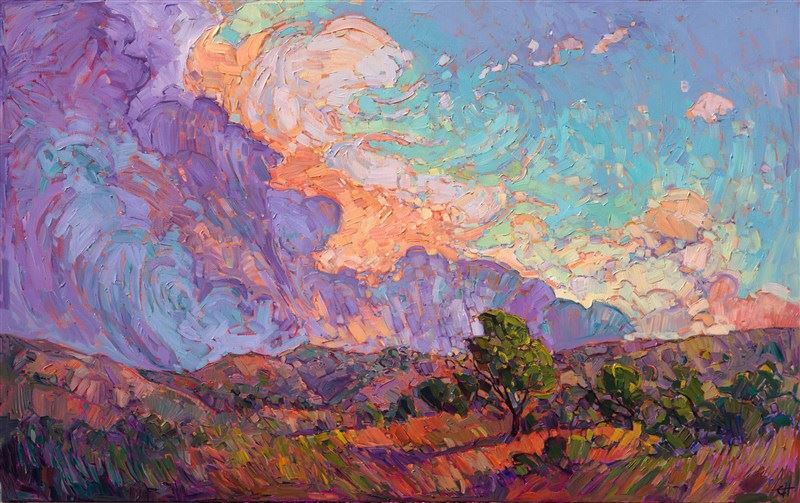 One question we often hear from our collectors here at The Erin Hanson Gallery is, “How do I light my new painting?” This is a topic close to our hearts here at the gallery, since we want every Erin Hanson painting to look its very best in every home. Because the lighting of a piece is so vital to one’s enjoyment of the artwork, we wanted to take a deep dive into the various lighting options you can utilize in your home or office as you display your painting. The most common way to effectively light artwork is to install a ceiling fixture which focuses on an individual painting. Most fixtures allow you to use the bulb type of your choice, so you are free to use the fixture that most aligns with the aesthetics of your home. When you point the bulb at the painting, focus on highlighting the center of attention within the painting. 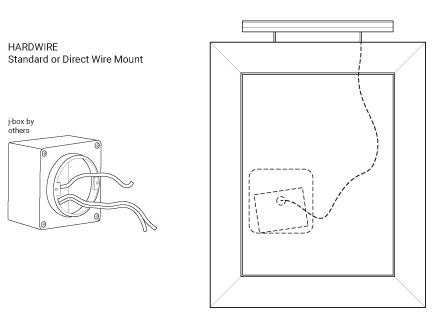 These directional recessed lighting units are adjustable, allowing you to illuminate your art in the perfect light. Track lights with adjustable lamps are a great option to cover a long wall of individual pieces. They can also serve to place two or three spotlights on one large painting. 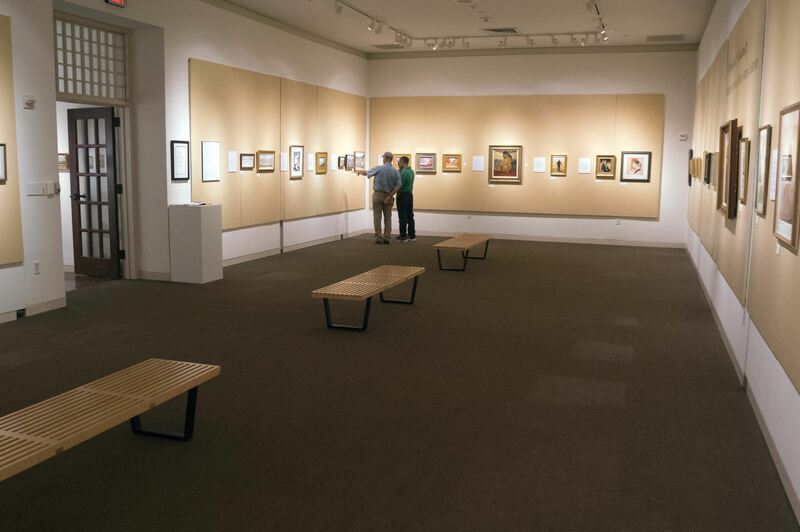 Galleries and museums all over the world use SoLux fixtures. 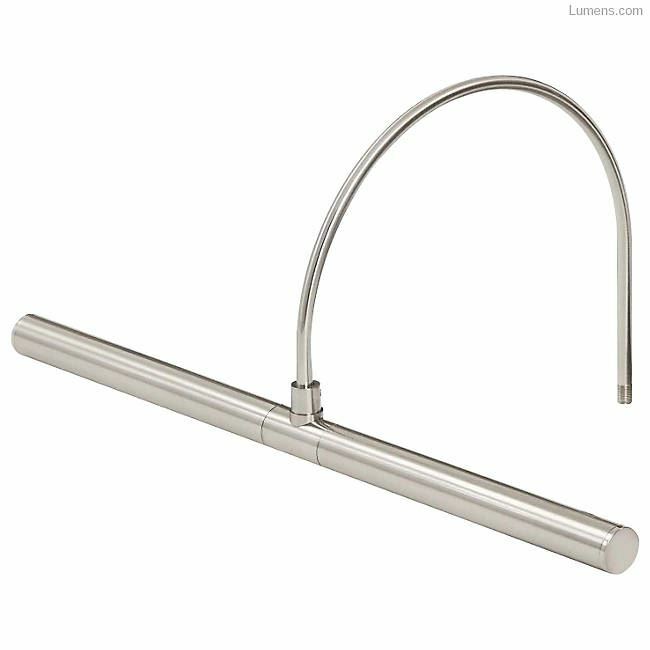 They are adjustable up or down and can be mounted on a wall or ceiling. We recommend their black-backed, 24-degree bulbs for these fixtures, with no diffuser. If you are hanging a favorite piece in your home or office for an extended period, ceiling-mounted fixtures are an excellent way to light up your painting. Correctly placing your fixture is essential to getting the most out of your product. Install ceiling lights so that the light has an angle of about 30°- 45° to the artwork. 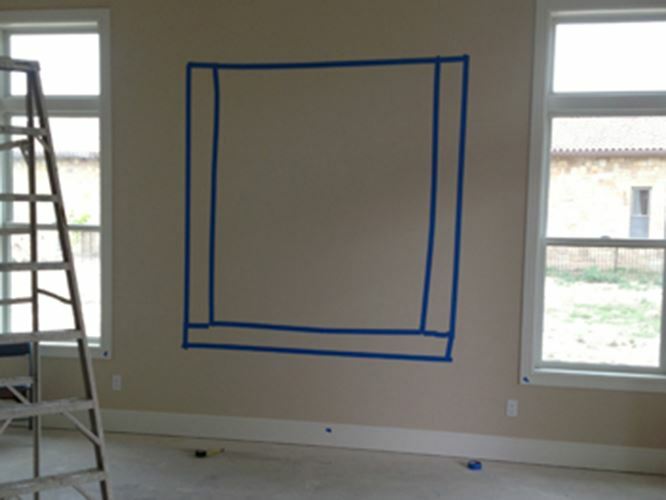 If the fixture is placed too directly overhead, you will have harsh shadows down the painting. If the light angle is too flat, then you will get unpleasant glare off the art. If the ceiling is very high, then you’ll also want to get a bulb with higher wattage and narrow beam to compensate for the longer distance. A 10° bulb will light a 30”x 30” painting when mounted on a 20-foot ceiling. Many spaces with high-ceilings or a rotating inventory choose to mount lights directly on a painting. This technique beautifully lights any piece, no matter where it is positioned. Picture-mounted lights are typically attached to the back of paintings and often use art-safe bulbs. Be sure to consult the lamp specifications and choose one with light that is suitable for your home. Revelite provides high-end art lighting solutions which can be customized to the dimensions of your painting. 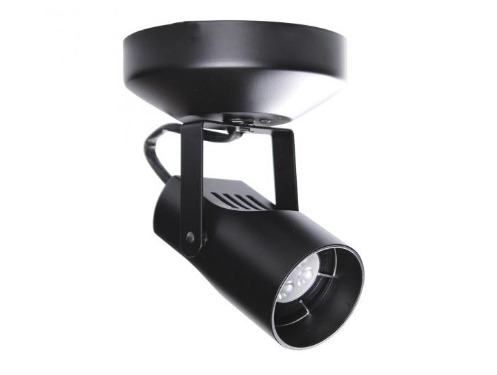 Their product offers even lighting with excellent color accuracy across the surface of the piece. 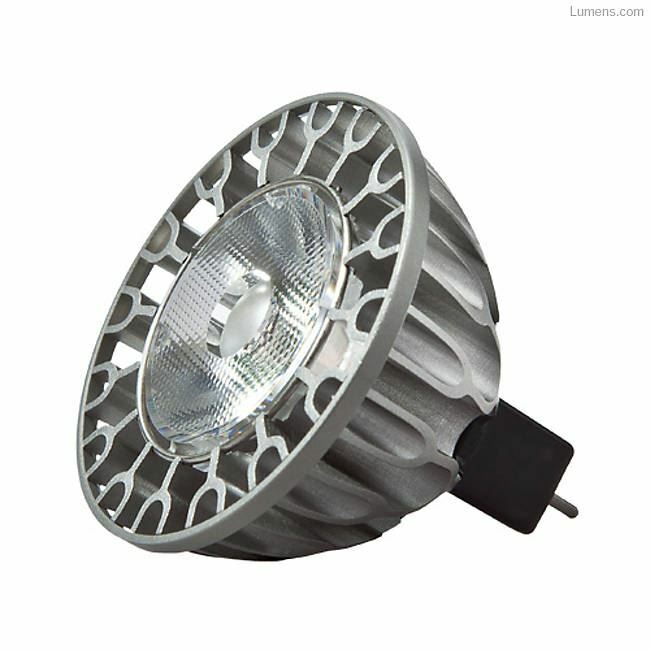 Lumens carries a variety of lights in all styles, temperatures, and colors. 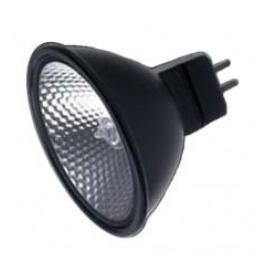 Many of them allow for either incandescent or LED bulbs. We often recommend LED lighting for picture-mounted lights, as these are cool and art-safe. These painting-mounted lights come in a range of styles. We recommend these fixtures for homes with warm light. 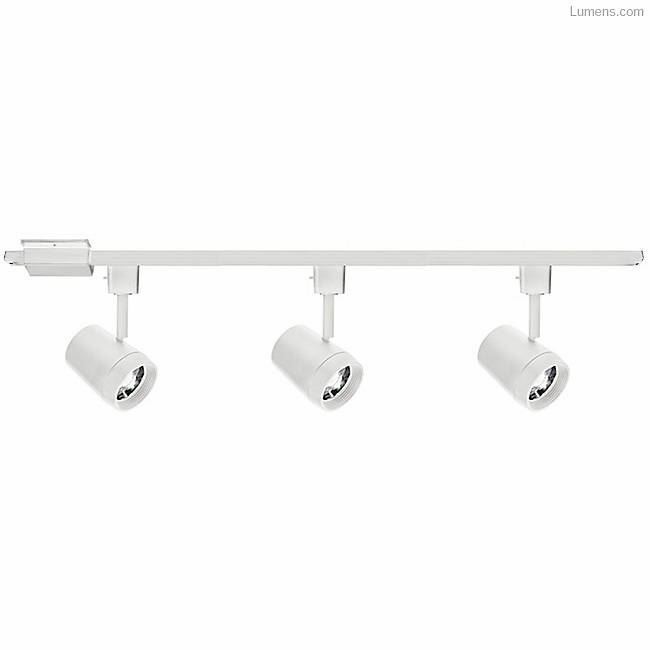 The variety of fixtures available mean that you can often choose how you’d like to power your picture-mounted light. 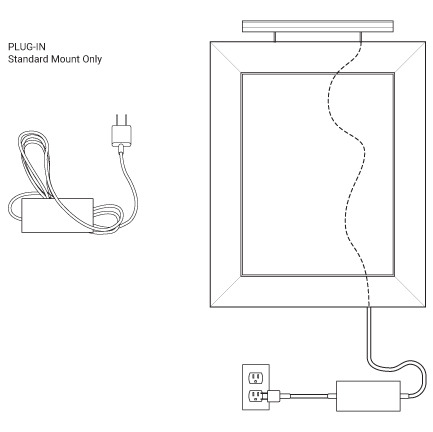 Some utilize battery power, others can be plugged into an outlet, and still others have hardwired power supplies that require an electrician install a circuit box into the wall behind the painting. This system is well-demonstrated by the graphic below, provided by Revelite.com. Some light fixtures give options for pre-installed bulbs. These options may be difficult to evaluate when purchasing lighting online, so The Erin Hanson Gallery would like to share our rule of thumb when it comes to purchasing artwork lighting. CRI is a scale from 0 to 100 percent indicating how accurate a given light source is at rendering color when compared to a reference light source. The higher the CRI, the better the color rendering ability. You want the light to bring out the art’s true color. Light sources with a CRI of 90 or higher are considered best at color rendering. Color temperature is a number assigned to a light bulb that tells you how warm (yellow) or cool (blue) the light is. Color temperature is measured in degrees of Kelvin (K) on a scale from 1,000 to 10,000. Light with a color temperature below 3500K will look warm, while a color temperature that is higher than 4000K results in cool tint. For homes lit in warm white, we recommend a lighting color temperature of 3000K to 3500K for your paintings. 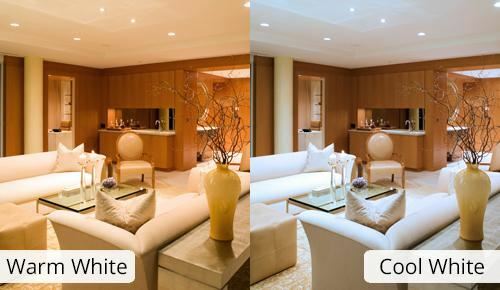 For homes illuminated in cool-white, we recommend a lighting color temperature of 4000K for your pieces. 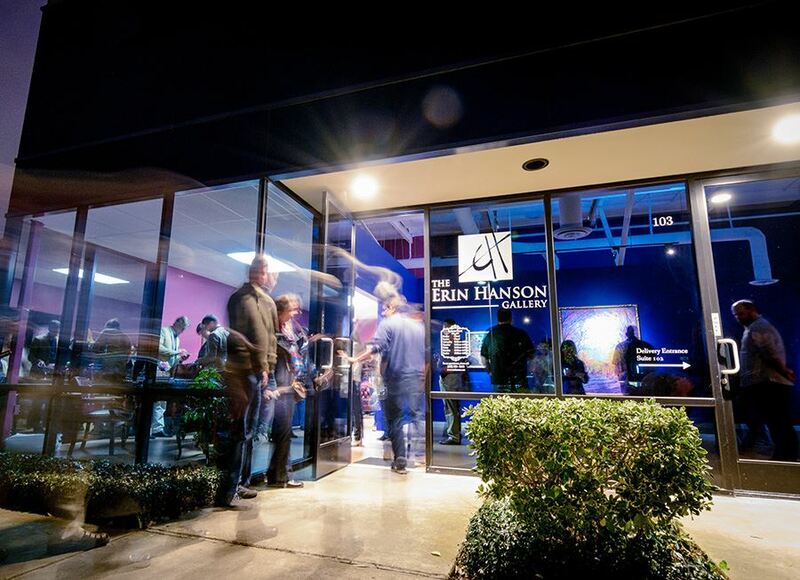 We use 4000K Sorraa LED bulbs at The Erin Hanson Gallery. 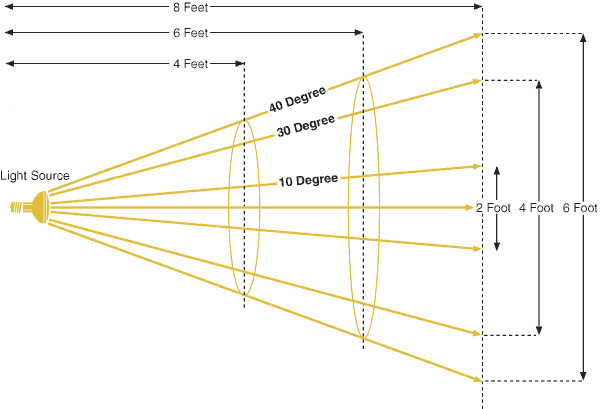 Additionally, the beam spread of the bulb determines how wide a circle of light your bulb will produce. 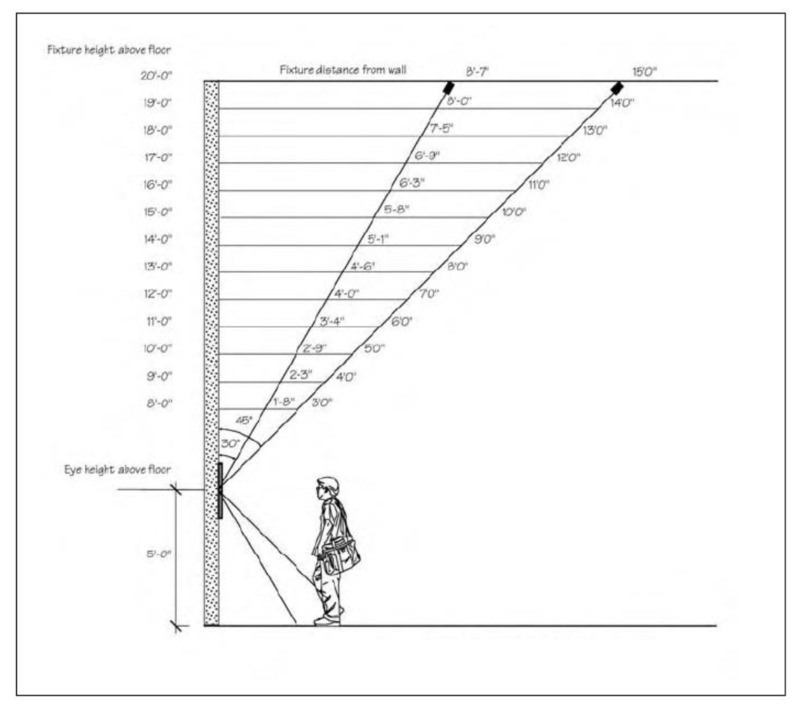 The beam spread is measured as an angle (in degrees). 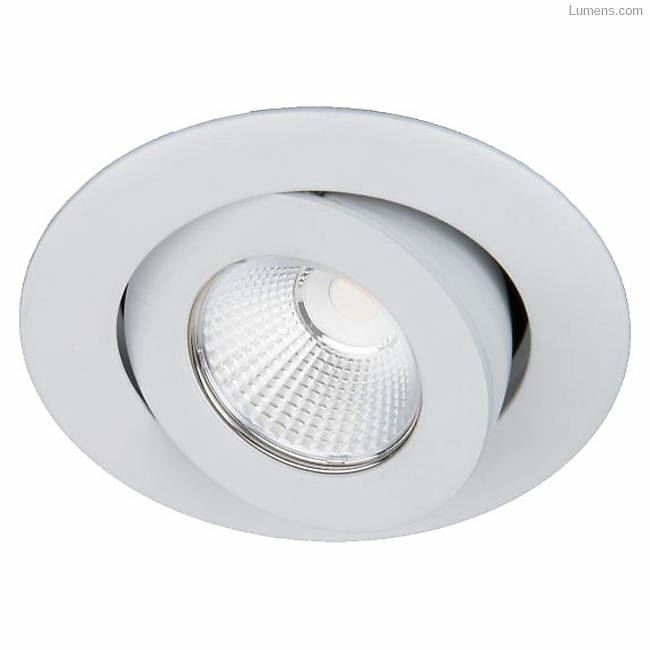 A 25° bulb in a ceiling-mounted fixture will light a medium-sized painting of around 40”x 40”. A 10° bulb will light a petite painting brilliantly. As the beam widens, the intensity of light decreases. So, when lighting larger paintings, we recommend setting two or three separate lights on the piece, rather than purchasing a wider beam bulb. These bulbs come with different bases, color temperatures, and beam widths. When dimmable light is desired, please consult your electrician before installing LED bulbs, as these may also require special circuits and wall switches. Halogen bulbs run hotter than LEDs. They also project light out the back of the bulb, unless the back of the bulb is coated (as in the image to the right). A “black-backed” bulb cuts halogen light leakage. Properly lighting your art will allow you to enjoy the piece as the artist intended. We hope this lighting “how to” has provided you with all the knowledge you need to illuminate the stunning work in your collection to its greatest advantage. 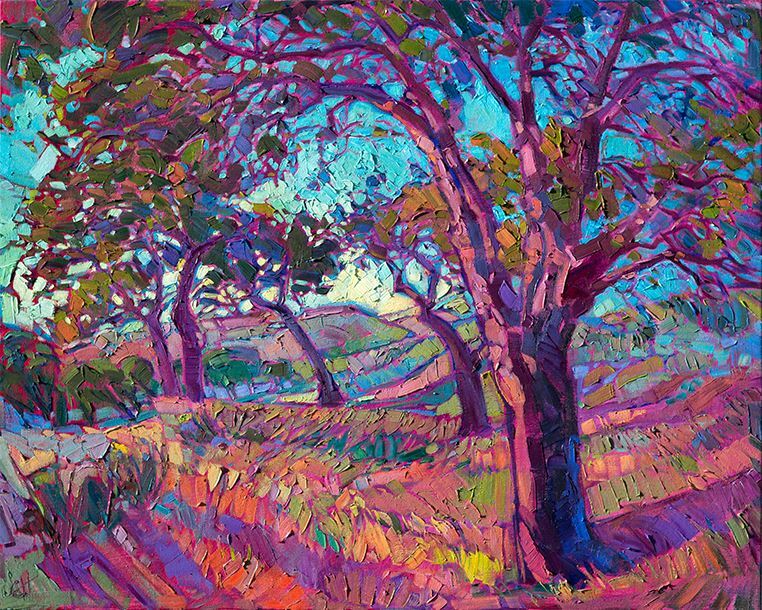 If you’d like to see how we light Erin Hanson’s artwork or would like to view her incredible pieces in person, we invite you to The Erin Hanson Gallery here in San Diego, CA. 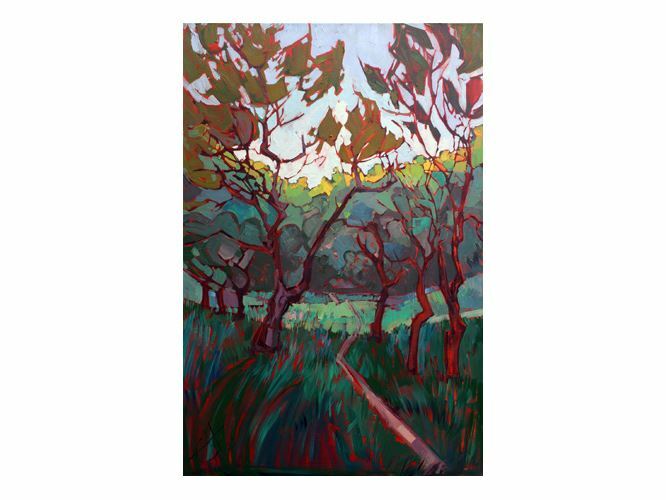 Erin Hanson offers fine art prints directly to her fans and collectors, at www.erinhansonprints.com. 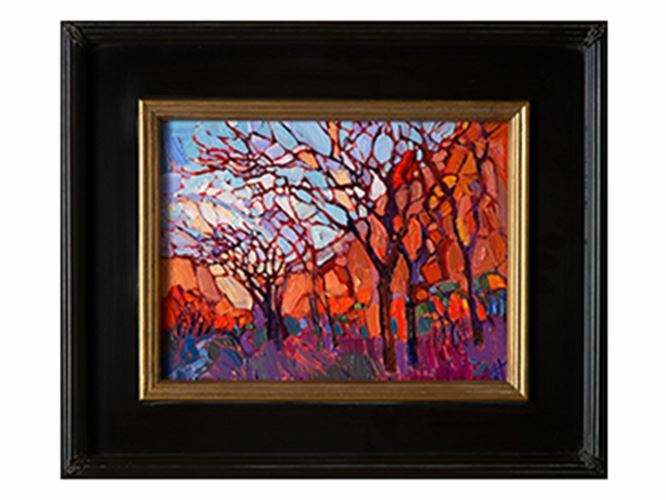 Learn about collecting Erin Hanson original oil paintings. While every style is celebrated in the Cowgirl Up! exhibition and show, there are specific categories in which the various artists can be awarded special recognition. 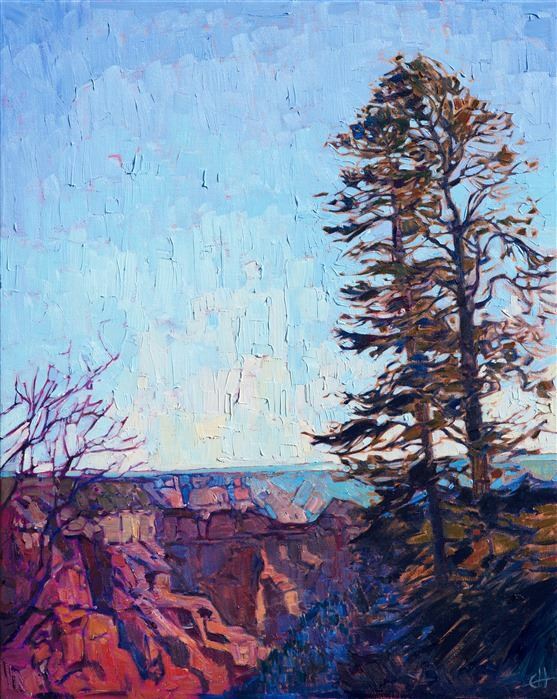 This year, we are honored to announce that Erin Hanson won “First Place Two Dimensional on Canvas” for her painting North Canyon. 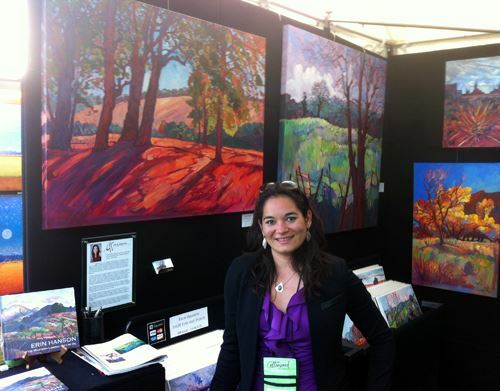 I have been painting Paso Robles for 8 years now, and it is still one of my favorite places to find inspiration. Although I have spent most of my life in California, growing up in Los Angeles and attending school at Berkeley in northern California, I never drove through the coastal wine country regions of central California until many years after I graduated college. I had seen the film "Sideways" and the wine tasting adventure looked like so much fun I just had to experience it for myself. So I ventured for the first time into the idyllic landscapes of Paso Robles. 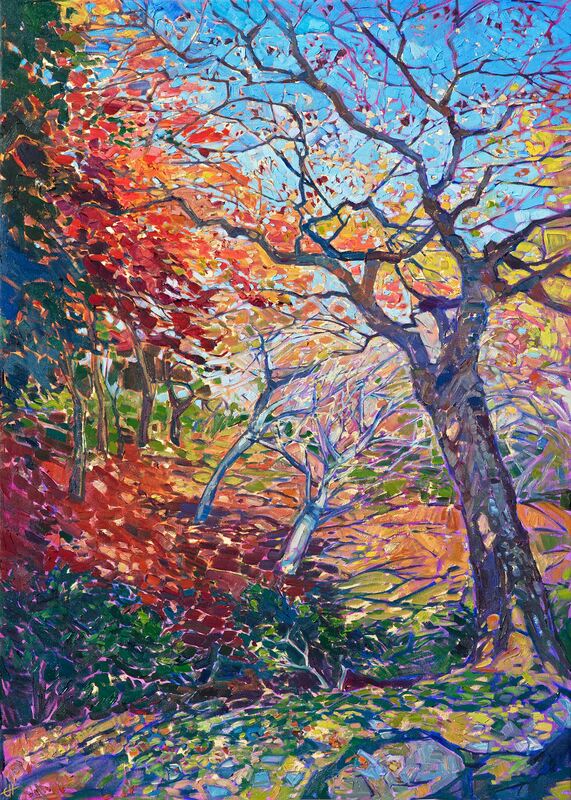 Erin Hanson’s Crystal Light series is one of her most popular collections of works. Each piece features a backlit landscape and seeks to illustrate the drama and beauty that light can bring to the natural world. While all of the Hanson pieces boast a striking understanding of light and shadow, the Crystal Light series really brings this to the fore. I went to Japan over Thanksgiving to explore the famous fall colors in Kyoto. The mountains surrounding the city are full of Buddhist temples with incredible gardens and maple trees. My favorite part of Kyoto was Arashiyama Park, home to several beautiful temples and wide, expansive grounds of natural beauty. Zion National Park has been a favorite haunt of mine for almost ten years. The landscape is quite varied, changing from high-altitude plateaus to steep cliffs of changing color, from slot canyons to river-bed scenery. I love visiting at different times of the year, seeing snow in January, yellow cottonwoods in the fall, and golden grass in the summer. 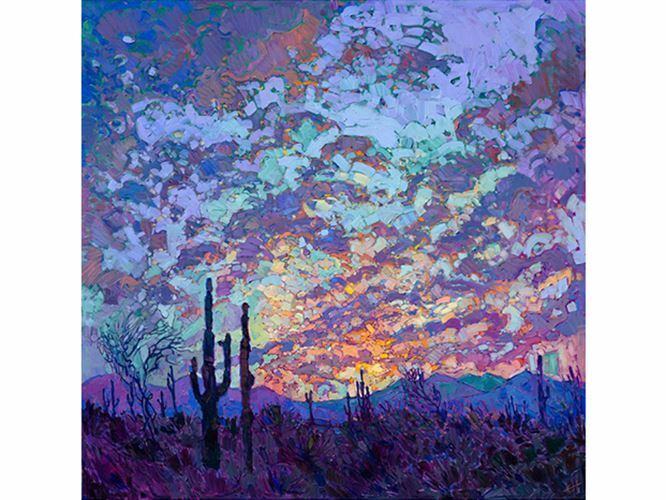 ​One common question we get asked at The Erin Hanson Gallery is “how do I clean my painting?” This is a vital piece of knowledge that every art collector should have in his or her repertoire. Whether you are a serious or casual collector, it’s important to know how to care for the pieces you cherish. 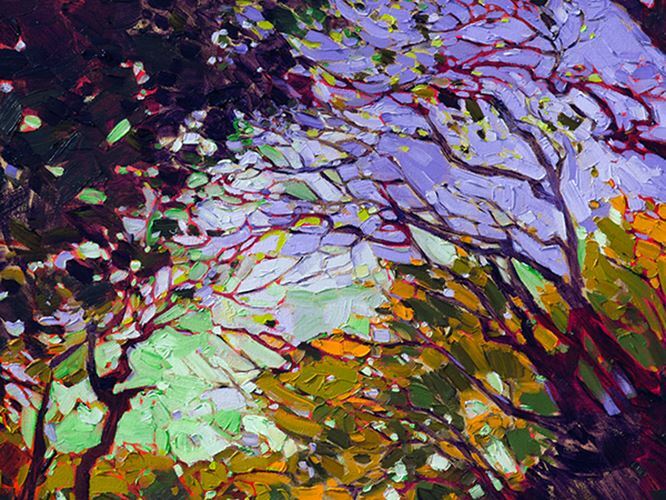 A Look at Impressionism and its Influence on Erin Hanson's "Open Impressionism"
Since its inception, Impressionism has been an expression of independence from the constraints the world has placed upon art. Van Gogh, Monet, Degas, and the others who helped create this art form were seeking to break away from traditional art and dared to see the world differently. This theme has carried on from the origins of Impressionism in the late 1800’s into present. 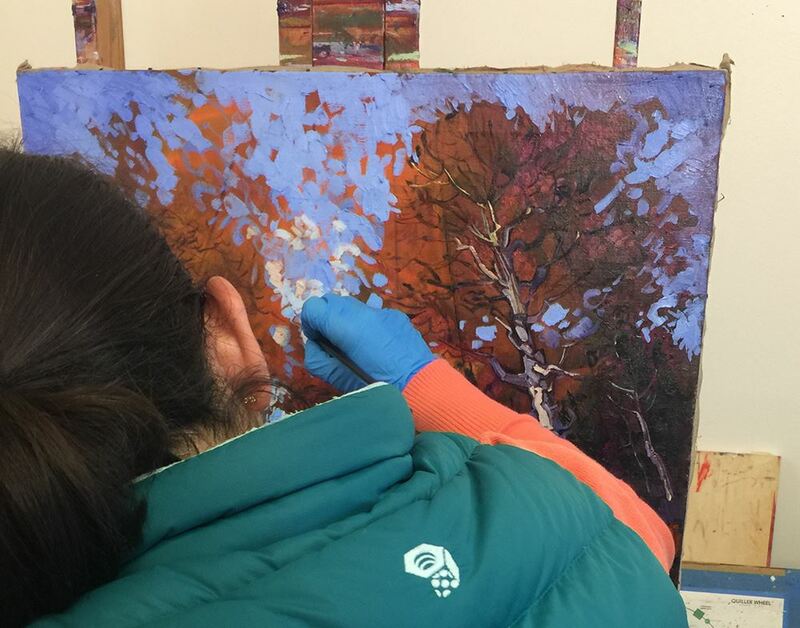 Erin shares her inspiration behind a recent painting inspired by Texas Hill Country. I visit Texas every year in the spring, and I always make sure to spend a few days in the beautiful hill country near Austin and the countryside north of Houston. Texas is full of color in the spring, the trees and meadows bright with new green growth. I have experimented with many framing options over the years: a decade ago I taught myself how to use a miter saw and joining tools, and I was making my own frames out of fine cherry wood molding. I have framed my work in simple floater frames, traditional plein air frames, and elaborate baroque frames. I have hung many paintings without any frame at all, letting the artistically-finished edges stand un-covered for a more contemporary look. 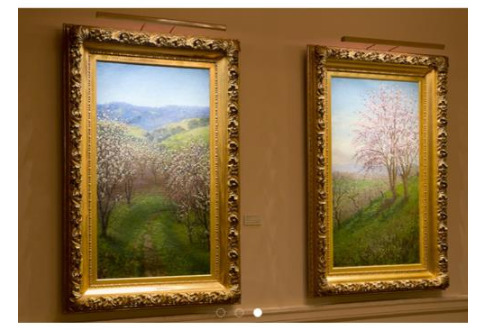 What are Open Impressionism frames? These hand-carved and gilded floater frames are a perfect bridge between the classic and the contemporary. 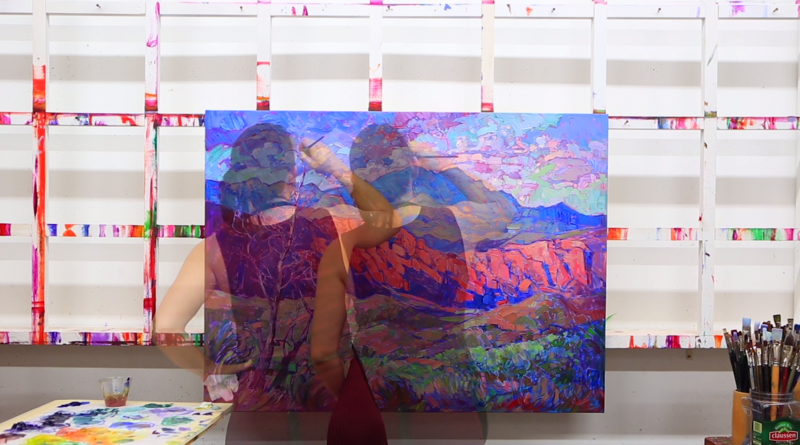 Erin Hanson demonstrates the step-by-step process of commissioning a painting from an artist. Learn how to commission a painting to match the colors and style of your home. Erin paints over an antique floral painting from WW2-era, transforming it into a new commemorative painting of a sacred Colorado camp. 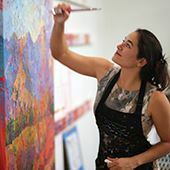 This is an essay that describes the technique and materials used by Erin Hanson, including information about lighting and framing. Why is impasto commonly used in Impressionism? Impressionist paintings are distinct because of how the artist applies paint to the canvas. 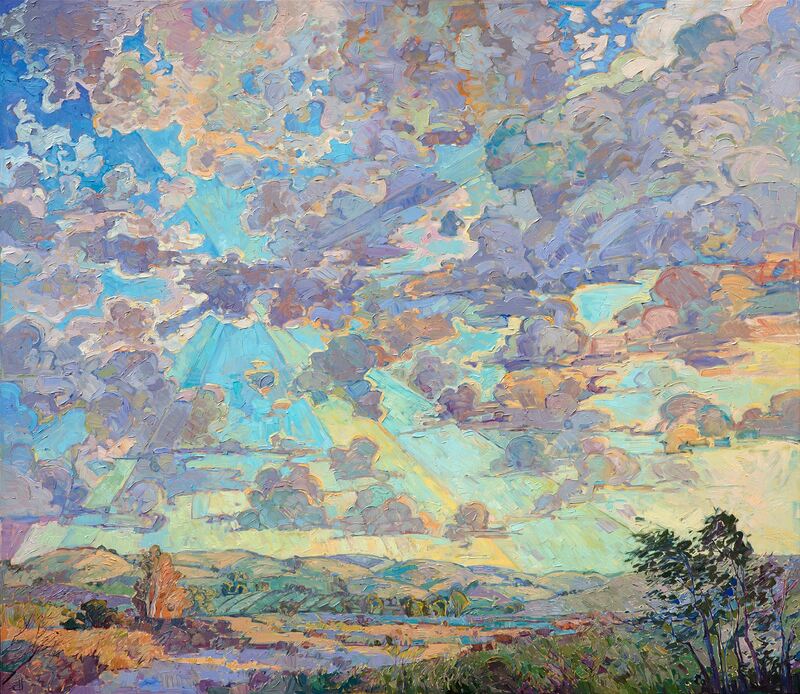 Impasto is a style that many impressionist painters have used since the birth of the art form. 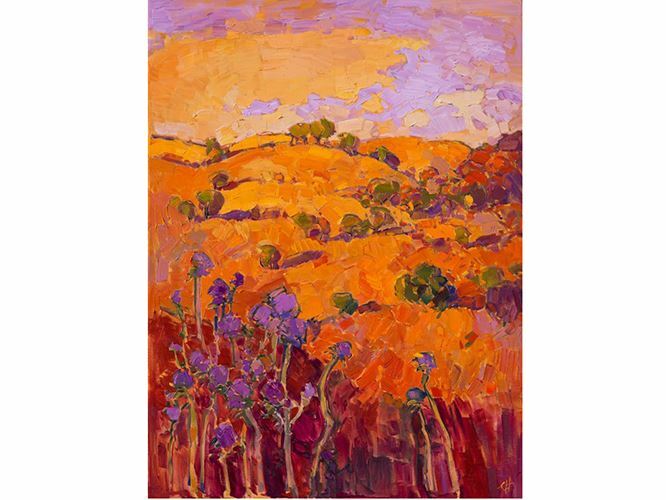 On Saturday, October 1st Erin Hanson's anticipated The Orange Show opened with ardent fans and steadfast collectors alike gathering to experience this unique collection. The various hues of orange contrasted beautifully against the midnight blue walls of her Los Angeles-based gallery. 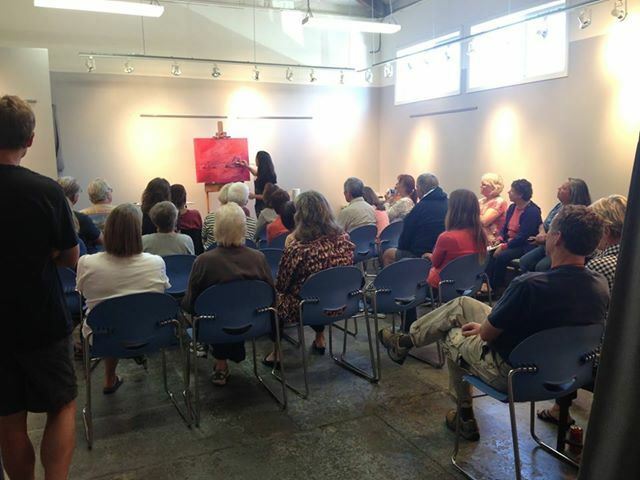 Erin's talk covered her key sources of inspiration, she also discussed her rise from discovering the red rock canyons surrounding Las Vegas ten years ago through to her current status as a forerunner in an impressionistic resurgence. 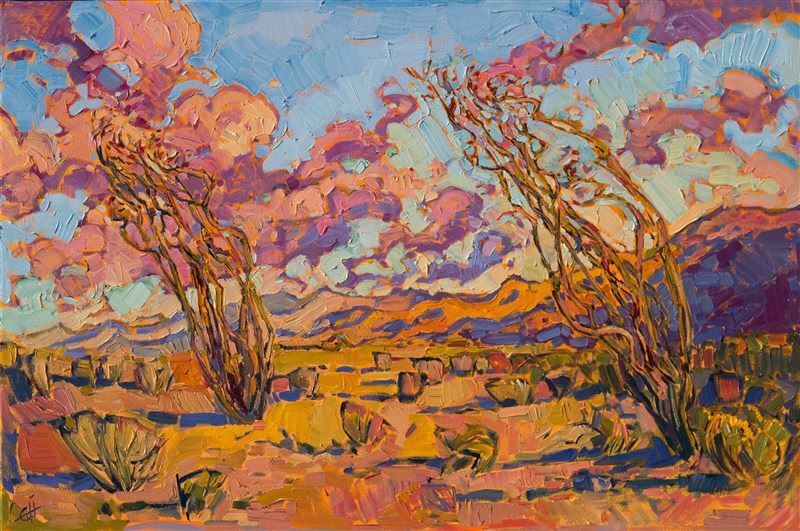 In Hanson’s upcoming The Orange Show, she dives deep into this color, capturing every tint of orange from amber to marigold. In this article, we take a closer look at each painting to be featured in the show. What is it Like to Get a Print from ErinHanson.com? 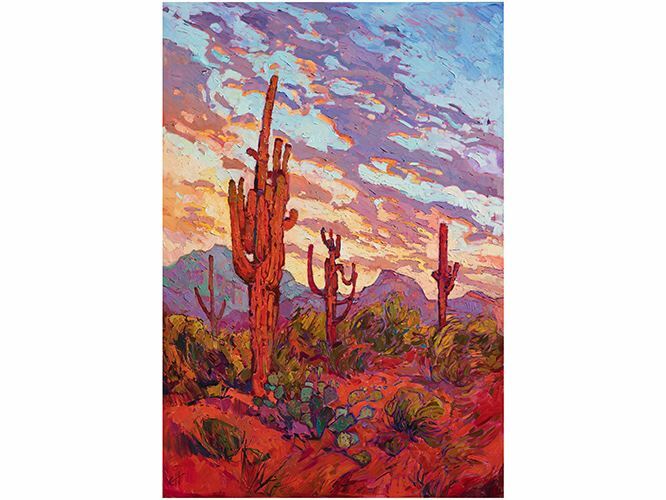 We wanted to show you exactly what happens when you order a fine art print through The Erin Hanson Gallery: two weeks ago the team ordered a print of Erin Hanson's Saguaro Dusk, a spectacular piece focusing on Arizona's iconic landscape. 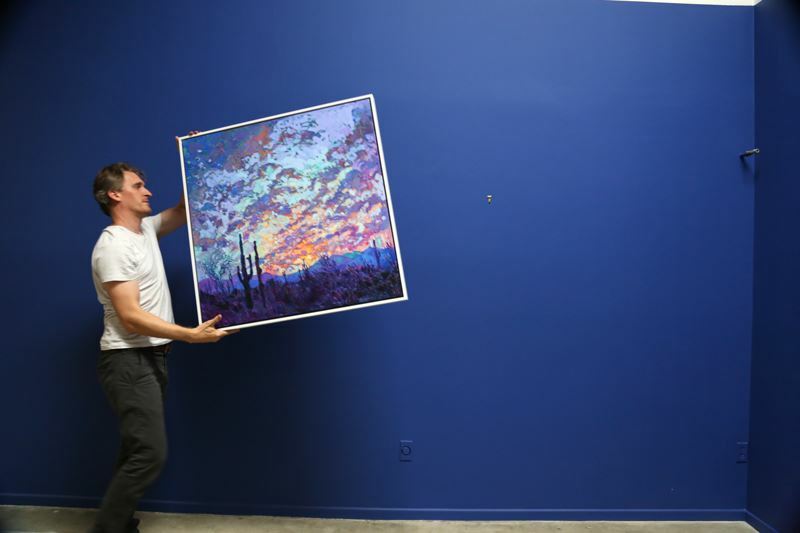 We selected the white frame option to contrast the vibrant purples of the piece and the gallery's midnight blue walls. Many art collectors have preferences for different types of lighting in their homes. Some prefer ambient lamp light while others would rather have spotlight-like track lights. No matter your preference, it’s important to understand that light affects each painting differently. "As viewers are flipping through my book, I want them to feel a sense of peace and I want to help inspire them to go beyond their everyday life. I hope this book inspires you to bring more color and beauty into your life." 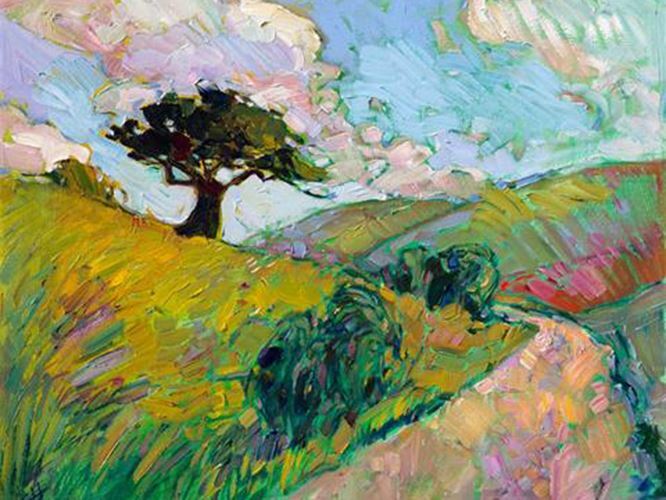 Impressionist painters of the past often used short, layered brushstrokes to create texture and depth in their paintings. 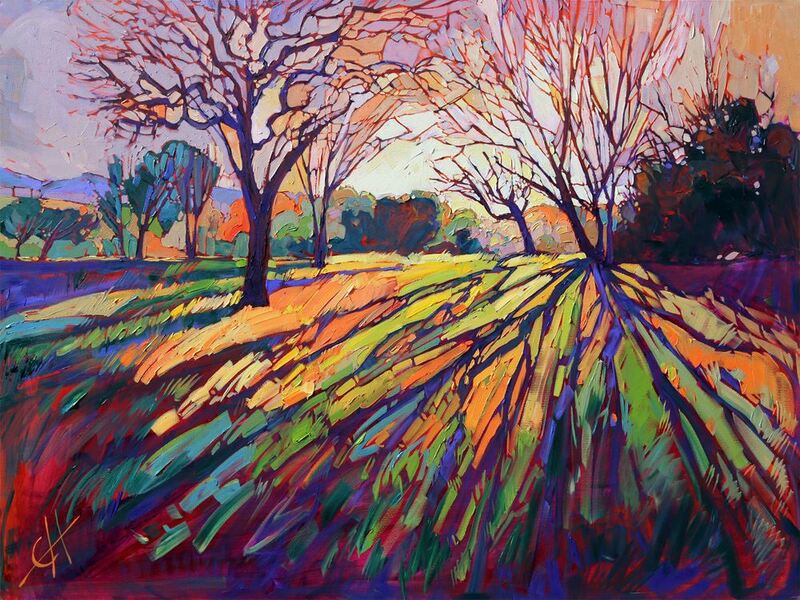 This is where past masters and the modern Impressionist painter Erin Hanson diverge. As Hanson works, she practices an economy of motion not seen by past masters. 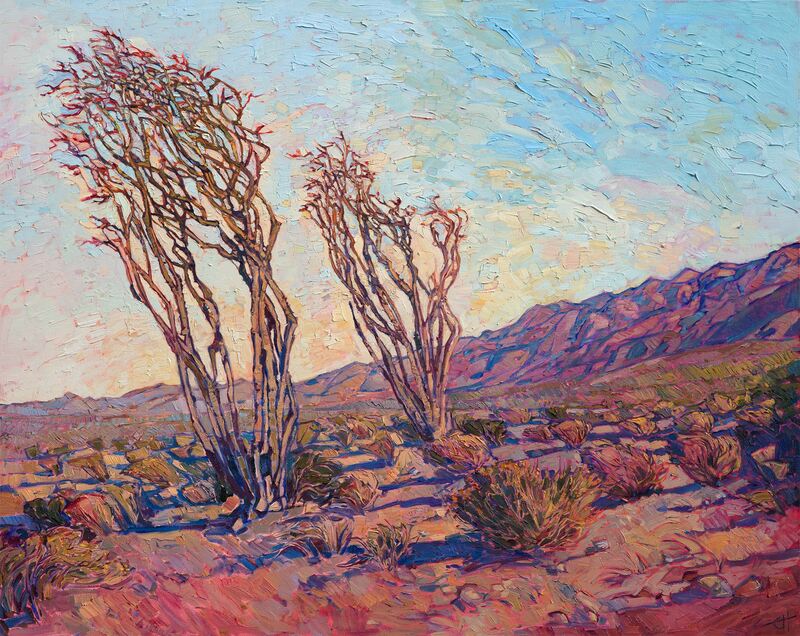 For example, one length of an ocotillo may by created in a brushstroke by Hanson, while the traditional, “classical” impressionist would paint in small strokes or even dots. Borrego Springs is a unique town. Surrounded by a 600,000-acre State Park in San Diego County, it is the only desert community in San Diego County. This town lays in a valley and is surrounded by desert. The land stretches out to the surrounding mountains. This makes Borrego Springs an incredible spot for beautiful color combinations. The startling blue skies are a glorious contrast to the sandy desert and wildflowers, which differ from the looming mountains. 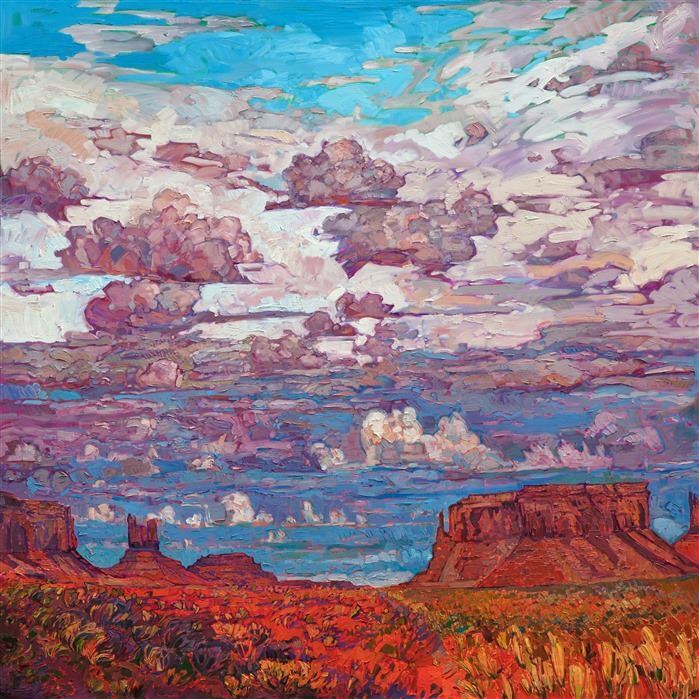 Erin Hanson explores the National Parks for inspiration. 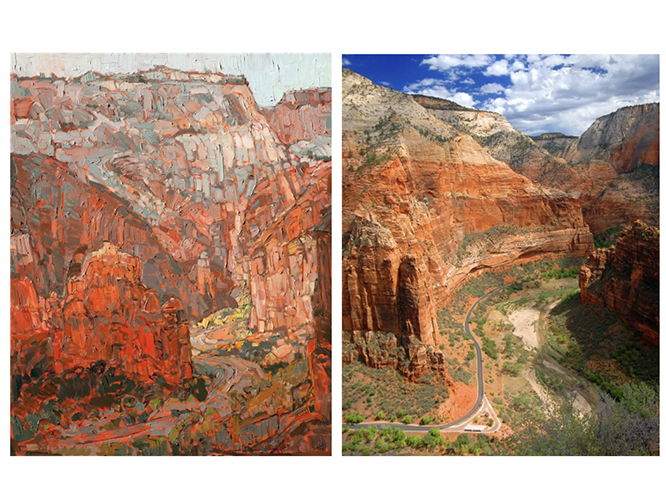 One of Erin’s favorite National Parks to paint is Zion National Park in Utah. This park features landscape that is truly incredible and worth capturing through brush strokes and photographs. The park features stark panoramas, vibrant rock formations, lush landscapes, and extreme biodiversity. 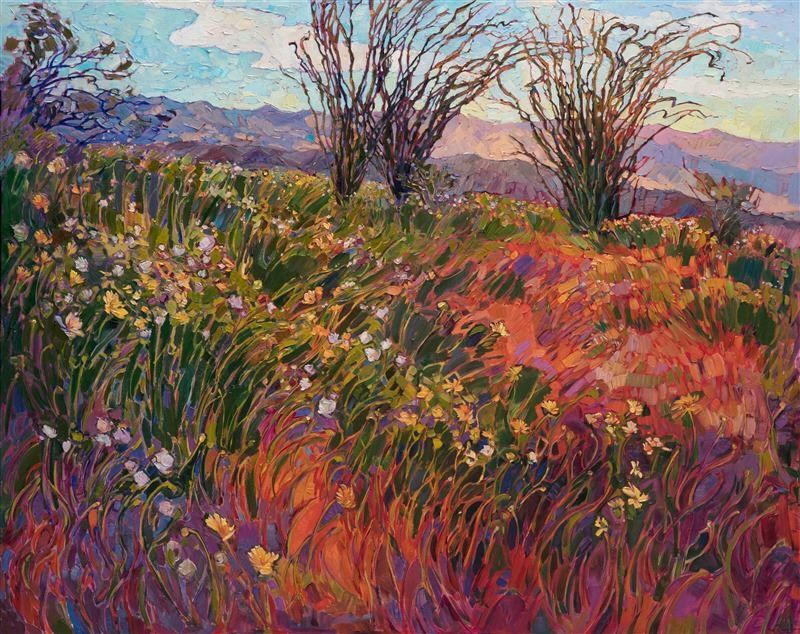 A wide expanse of wildflowers sweeps across the canvas in this large oil painting. 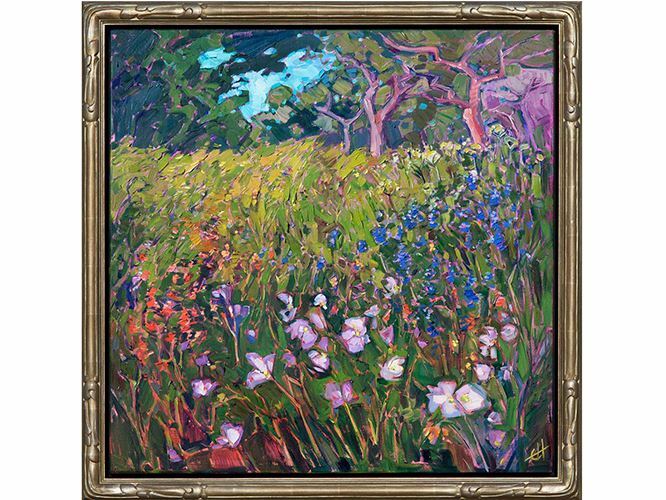 The expressionist movement of brush strokes captures the vibrancy and color of the poppies, thistles and daisies growing among the grasses. 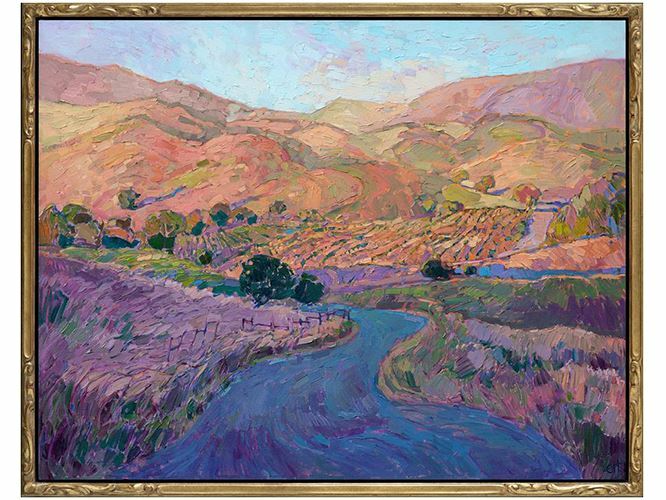 The abstracted shapes of the landscape come together in a harmony of motion and color. 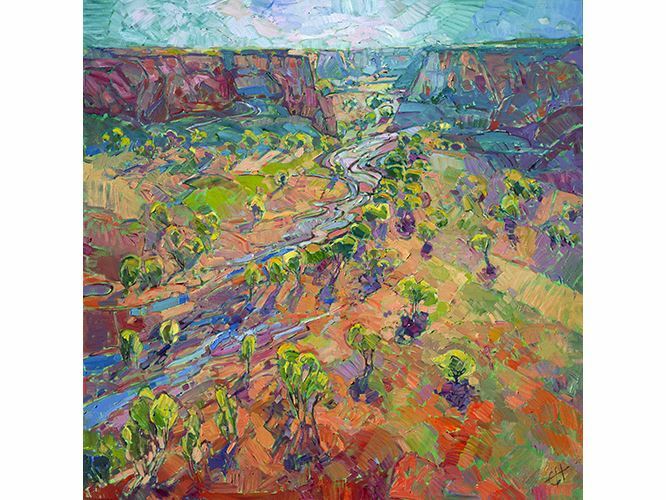 Canyon de Chelly National Monument as captured by the swift brush of artist Erin Hanson. 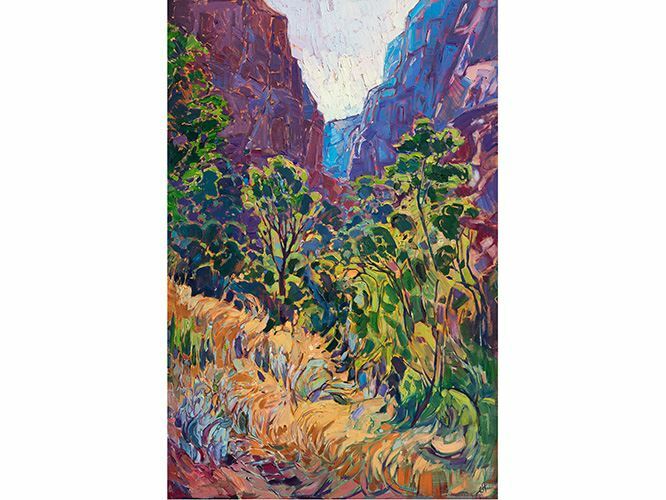 "Canyon Color" will be on display at the St. George Art Museum until May 28th, 2015 as part of their National Parks Centennial event. Part of the 24 Karat Collection, Woods of Gold is a close up of the famous golden aspens of Cedar Breaks National Monument. Featuring a underlying layer of 24 karat gold leaf, it gleams with warmth to brighten any room. 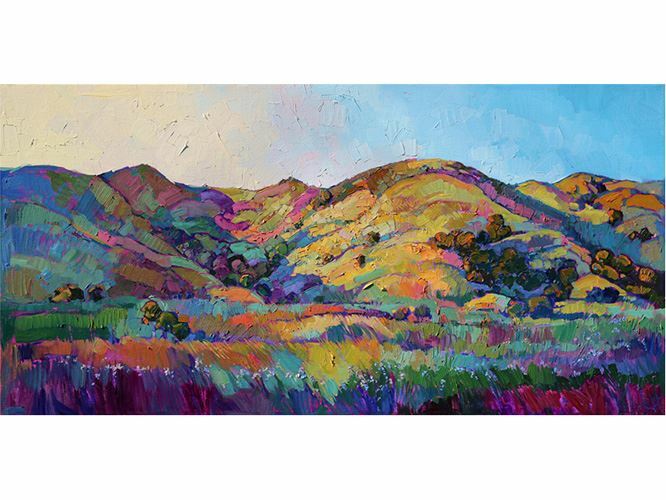 Paso Robles is shortened from the original name El Paso de Robles, which means 'The Pass of the Oaks.’ Paso Robles is wonderful place to visit - for the stunning landscapes and for a variety of activities. How Should I Frame My Original Oil Painting? 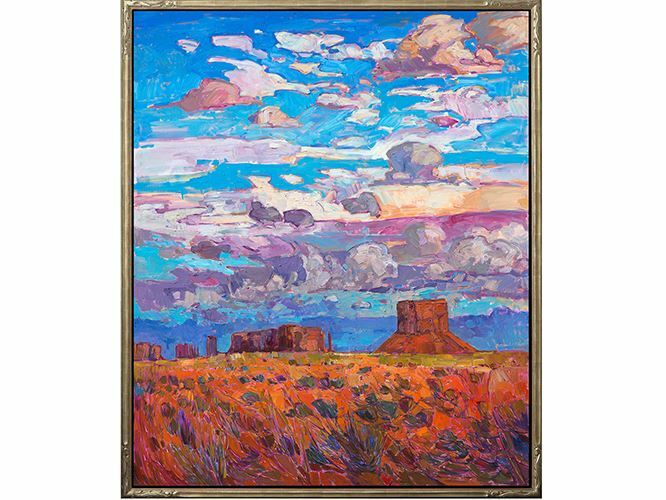 Whether or not you decide to frame your gallery-wrap oil painting, it will be a beautiful and eye-catching addition to your room, bringing in a breath of color that is a joy to design around. 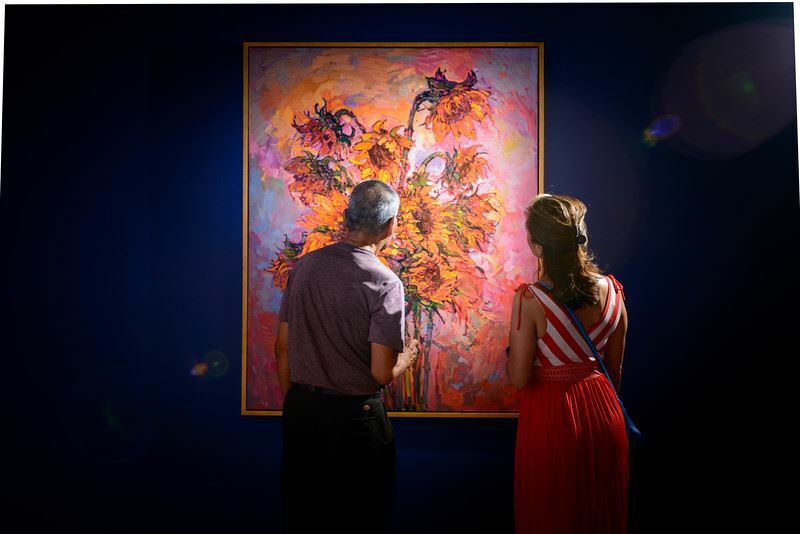 Art festivals are the perfect way to take your art career into your own hands, gradually building your collector base until you can support yourself entirely on your fine art sales. 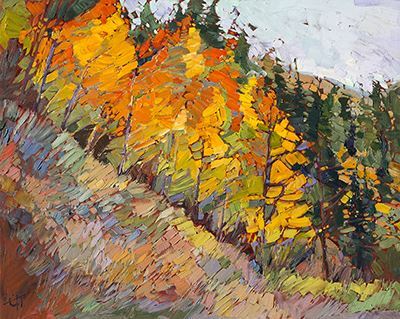 "Hanson’s paintings are bold, often times large in scale like the grandeur of her inspirations. 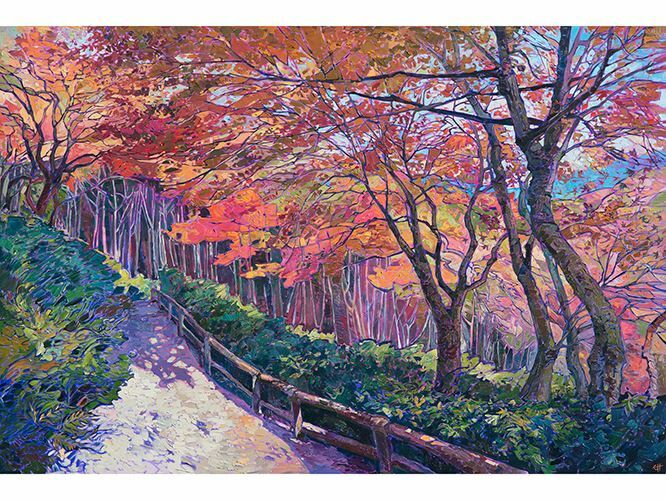 Her loose “open” strokes and pure colors represent her singular vision to the beauty of the landscapes that surround her. When asked about her inspiration she says, 'whenever I find myself in a slump, I take a hike.'" Do you love an artist's work but need a special painting for a certain wall in your home? 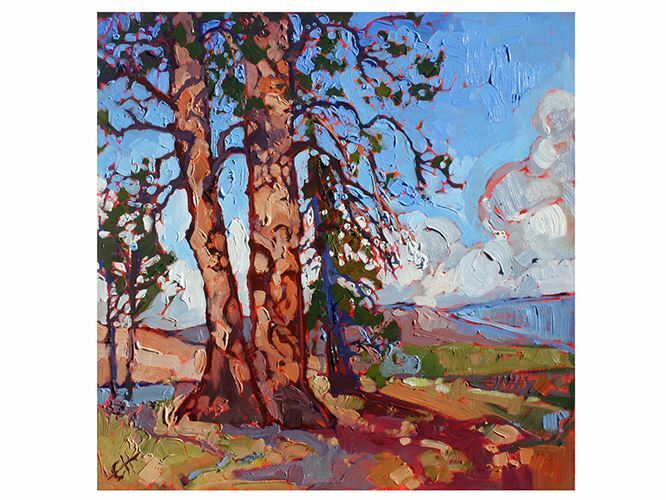 Erin Hanson presents a new series of small oil paintings on board. 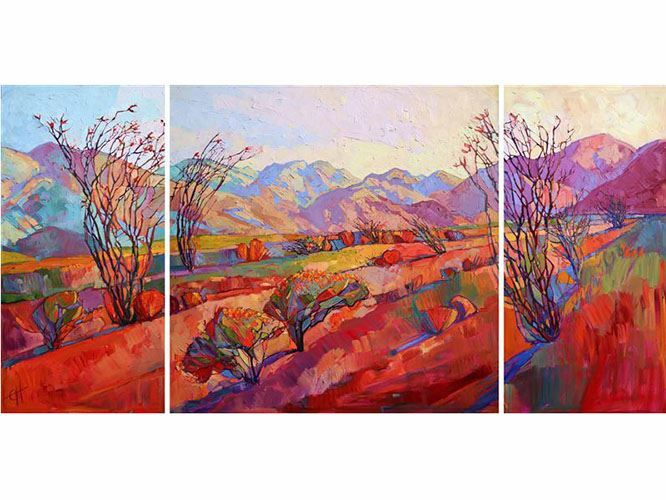 Inspired by treks across Utah, Nevada and California, Erin transforms desert landscapes into a mosaic of color impressions. It's always nice to take some time from my busy schedule and just observe the landscape around me, concentrating on mixing a new array of beautiful colors from my limited palette. What is the Best Lighting for My Painting? 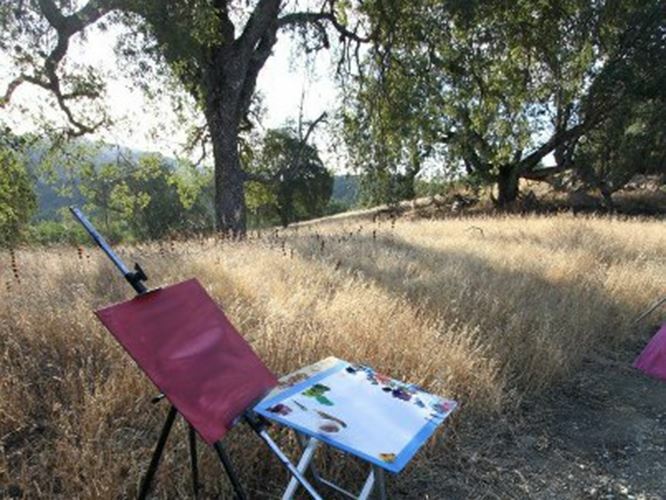 Natural ambient light will create a nice feel for your painting during the day, the colors subtly changing as the sun rises and sets during the day. At night, however, you will be fully reliant on artificial light. Fewer strokes is better in Open-Impressionism. Color choice is secondary. Texture and spontaneity are everything.